Erin Hunter’s #1 nationally bestselling Warriors series continues with the fourth book in the New Prophecy series! The fourth book in this second series, Warriors: The New Prophecy #4: Starlight, brings more adventure, intrigue, and thrilling battles to the epic world of the warrior Clans. Before there is peace, blood will spill blood…. 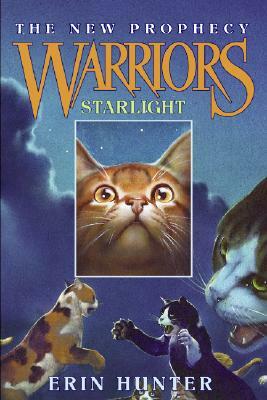 The Clans have finally arrived in their new home, and now they must struggle to establish territories, learn hidden dangers, and find a new place to communicate with StarClan. But more than one cat is harboring sinister plans that could lead to violence and darkness, and as the warriors wait for a sign, they begin to realize that the threats they face in the forest may not be as perilous as the threats they face from within.